Who is the animal statue of in the Game of Thrones Season 8 Teaser Trailer? In the newly released Game of Thrones Season 8 Teaser Trailer, viewers are teased seeing three Starks (Jon, Sansa, and Arya) venture through the crypts of Winterfell. At one point (8 seconds in) Jon passes the statue of his alleged mother Lyanna Stark, next to her however is a statue of a direwolf! Perhaps this was just added to enhance the "Stark" theme to the teaser to either make viewers remember there are dire wolves left, that this is the sigil of House Stark so of course there would be direwolf statues to motif this throughout Winterfell, and/or to tease us that the Starks and The Night King are more directly interrelated, as direwolves haven't been seen this far south in a very long time, marking the return of The White Walkers marching south and whose arrival is often cited as an omen (not to mention theories). However, is it possible that this is a specific direwolf affiliated with the house sometime before? If so, then who? 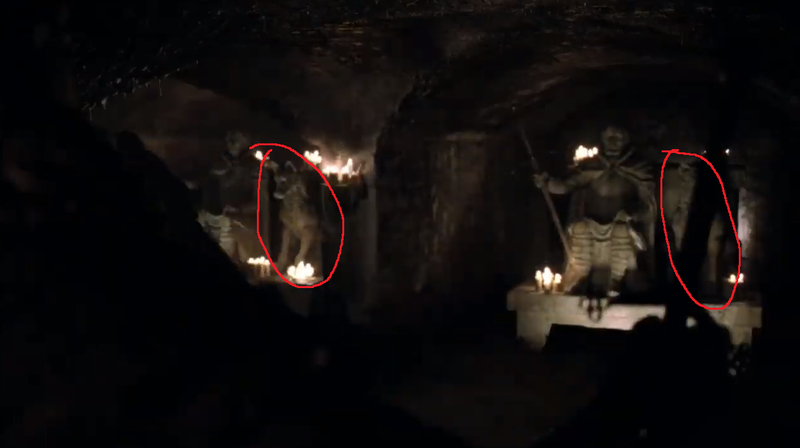 Because all of the tombs in the crypts are accompanied by statues of the Stark in them and a Direwolf with them as it is on their House banner. You can even see this in the very first episode, "Winter is Coming", as Ned and Robert walk through the crypts. 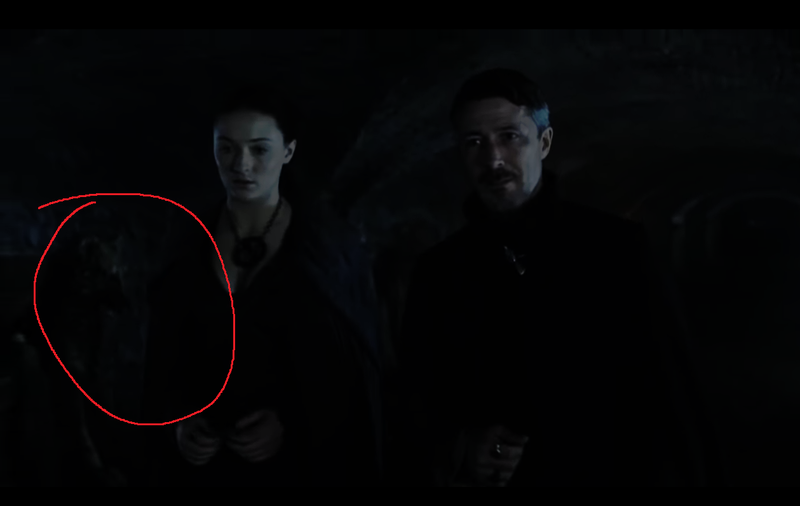 We also see what appears to be a Direwolf statue later on in Season 5 when Sansa and Petyr are walking through the crypts. For some reason I can't save an image of the scene above showing the direwolf with high enough quality. However, if you watch the scene you should be able to see what could be one at ~2:46 and what is almost certainly one at ~2:50. In fact this even has precedent in the books although there the Direwolves are curled around the statues feet. He led the way between the pillars and Robert followed wordlessly, shivering in the subterranean chill. It was always cold down here. Their footsteps rang off the stones and echoed in the vault overhead as they walked among the dead of House Stark. The Lords of Winterfell watched them pass. Their likenesses were carved into the stones that sealed the tombs. In long rows they sat, blind eyes staring out into eternal darkness, while great stone direwolves curled round their feet. The shifting shadows made the stone figures seem to stir as the living passed by. While all family members can have tombs in the crypts, statues are traditionally only made for Kings in the North and Lords of Winterfell. The likenesses of these high lords are carved into the stone, some shaggy, some clean shaven. Large stone direwolves curl at their feet. Why is Arya Stark allowed to do this in the season 6 finale of Game of Thrones? How come the season finale for Game of Thrones hit viewer record? Why can't this character in Game of Thrones have children? How many years have passed between each season of Game of Thrones? Why did Game of Thrones only have 7 episodes in season 7?